To save some effort in doing height conversions, I've started playing around with using pliers to lengthen limbs when only a minimal increase is required. To use this technique, I first find an area that does not have a lot of detail, and then squeeze the metal with narrow jawed pliers until the desired length is achieved. Kneadatite is then used to restore the shape of the limb. I have found that I can perform height conversions much faster using pliers, than by cutting and pinning. The only problem I've encountered with this method is that sometimes I have ended up severing a figure's limb by weakening the metal too much. I'm not sure if this is related to the fact that I am using pliers with serrated jaws, but if I can find some smooth jaw pliers I'll have to test this hypothesis. Of the figures below, I only used the compression method on the BRF Amazon and minotaurs. The rest were modified using the cut and pin method. 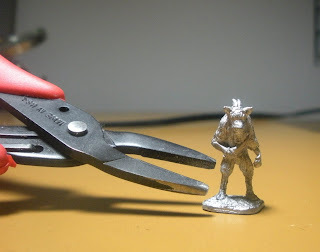 The thick limbs of the minotaurs allowed more length to be squeezed from the metal before getting too weak, so I was able to add quite a bit of height to them. The charging minotaur looks pretty good, but the legs of the other minotaur look kind of strange. 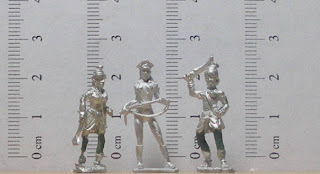 I also thought that perhaps I made the maiden guards a little too leggy, but now I'm not so concerned. I'll probably cast the midsection of this lizardman so I can just do a cut-and-paste job when converting the rest of my lizardman figures.